I must be mad. I’ve signed up for another year of the 52 challenge. What was I thinking of? Well, what’s done is done so here are this weeks photographs. Once again I urge you to click on the photographs to see them in a larger size. I had a meet up with some old friends in Llanberis yesterday morning and since I was in the area it seemed to good an opportunity to miss photographing the lone tree which sits on Llyn Padarn. It was still early in the morning and a bonus – no one about on the lake. Usually it’s full of canoes and kayaks, around this area of the lake there are a few training areas. Llyn Padarn is full, I’m not surprised what with all the rain we have been having. Usually you can see the roots of the tree, sometimes even walk right out to it without getting your feet wet. After the meet-up I decided to take the long way round,to get home, it was such a nice day. Over the Llanberis Pass and through the Ogwen Valley. An area I know well as I spend a lot of time here with my camera. Once through the pass and on the way down I noticed this small lake which was absolutely flat calm. If you click to get a bigger view of the photograph you can just see the road with two cars on it. It disappears around the side of that mountain before rising steeply to the top of the pass. 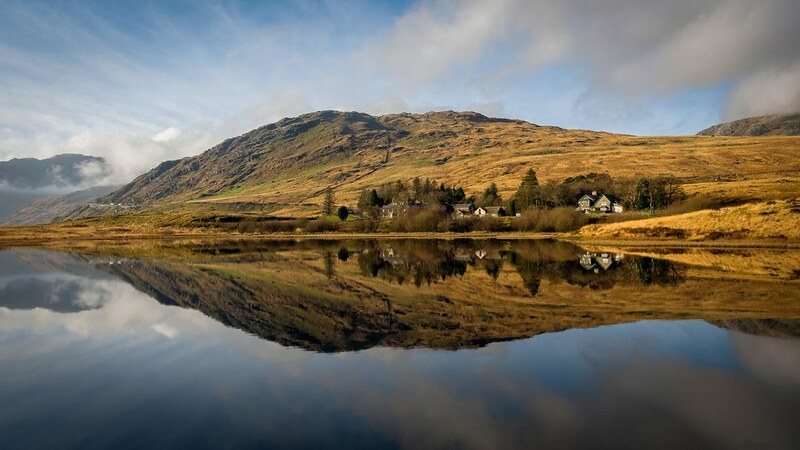 Flat calm, with a perfect reflection. Just what I need for this week. Fortunately there’s a good parking place and I was able to walk across the wet and boggy moorland to get this photograph. That it for this week. I hope you enjoyed the photographs. It looks peaceful when I was there because it’s midweek, Mabel. At the weekend it gets really busy as both spots are popular with walkers, hill climbers and kayakers using the National Park. Thank you for taking the time to comment. Thank you Cee. I must admit I’m rather pleased with the second one, especially as I decided to stop there more as an after thought than a planned one. Two great images and I like how you have rendered them. 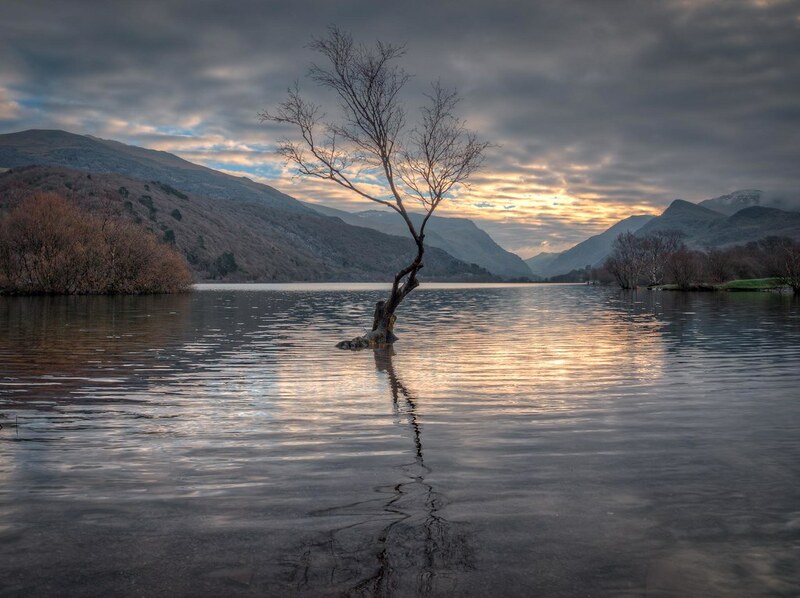 How did I miss that tree on Llyn Padarn?! We were just there. Darn. Unfortunately, that was likely my one and only chance but north Wales and Snowdonia were on my list and I am ever so glad I made it. Beautiful, stunning scenery. Very nice photographs. You have a good eye. I always do. You’re one of my favorites. You got me with those…such richness and delicacy. I was lucky with the second one, Cynthia. When the sun comes out it makes the moorland light up with a nice golden glow. Low light for the first one helped to accentuate the tree against the sky. Perfectly beautiful, what an incredibly beautiful part of the world we live in! That’s for sure Theresa. No matter how many times I visit my Snowdonia Trainangle (Llanberis – Capel Curig – Ogwen Valley) I always find something different to photograph. The shot at Llyn Padarn is exquisite. I could just sit there. Never mind driving home. I like that tree too Janet. It’s not the easiest to find, but once you know where it is it’s worth going back time and time again.